I was recently watching a show when something really moving happened and I was struck by the emotions that rose to the surface as a result. The main character's best friend was dying of cancer and had reached the end of her life. She was ready to die but the friend was distraught and started listing off ways that she could fight the cancer (classic bargaining) - even though the friend had been through several rounds of various treatments. 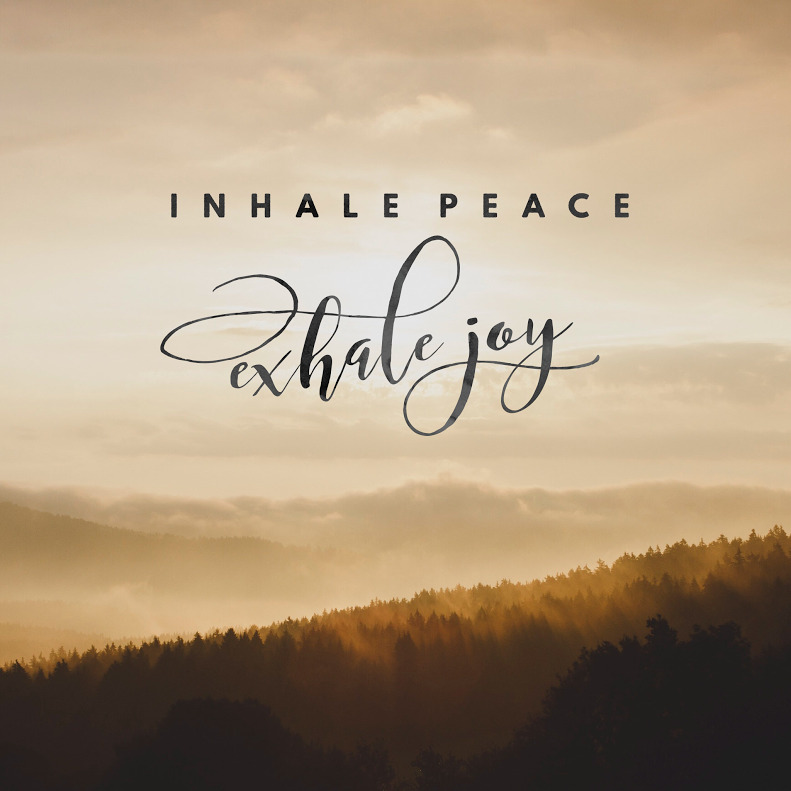 As the friend listened to her talk about eleventh-hour plans of uncharted treatment territory, the dying woman reached for her friend's face and said, "Inhale Peace, Exhale Joy". My heart just filled with so much warmth when I heard that and I haven't been able to stop thinking about this scene, or those words, since. In the last few years, I've had a lot of ups and downs and a LOT of change. I've grown to understand myself in a way that I never have before. I've had lots of growing pains as I've struggled with relationships, been unsure of where to go on my life's path and wondered if I'm doing this right. There's a lot of second guessing and heartache that comes from being a human, especially when you're dealing with depression and anxiety. Peace is an elusive thing for most people. We may have moments of it in our lives but as experiences and situations get more complicated, the peace + joy goes with it. Even though I've been feeling so happy as a more authentic part of me has come out in the last few years, the complication of disappointing people I love has been difficult to feel at peace with. So, how do we "inhale" peace? I have no idea... but as I've contemplated this phrase over the last few weeks, I've come to realize that for me, it's acceptance. There are many things I cannot change - mostly other people's choices are what bring me the most pain. All that I can control or change is myself. I can accept responsibility for my own actions and worry less about what other people do as a result. I don't get to choose how others react to my choices or expressions, but I believe I can feel peace by accepting and valuing my own. As I've tried to implement this... 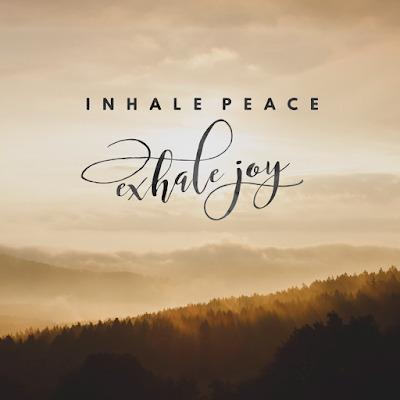 I've failed, but I've found that the literal act of a deep "inhale of peace" helps remind me of my joyful goal and it allows me to refocus and relax - an important tool for a person with anxiety. I have been amazed at how much this has helped me and I really believe that the only way to live a happy life is to life a peaceful life. I literally just finished watching that. Thanks Cay! I love that show! Real charity is not something you give away; it is something that you acquire and make a part of yourself. And when the virtue of charity becomes implanted in your heart, you are never the same again. It makes the thought of being a basher repulsive. Charity and peace definitely are intertwined. I'd never thought of it that way before today, but it makes sense, doesn't it? Great quote, Diane. I especially like "Charity is refusing to take advantage of another's weakness and being willing to forgive someone who has hurt us." That is so hard to do but I agree that it creates peace and with peace, comes joy. Thanks great insights about Charity. Love your blog and you! You are a beautiful person inside and out and an amazing mom and wife. I have friends whose lives have totally been changed by using Q96 for anxiety and depression. It is micronutrients we can't get from our food that our key for our minds to function properly. You are welcome to keep this post private. I just thought I should mention this as I read your blog today. Much love to you! You are welcome to contact me on my e-mail at nonifdavies@gmail.com if I can be of further help or put you in touch with some. This doesn't need to posted either, I just wasn't sure how else to reach you.